Service Dogs to Help American Veterans! 30% of our American Soldiers return home with PTSD or traumatic injuries. This is a sad and devastating reality. 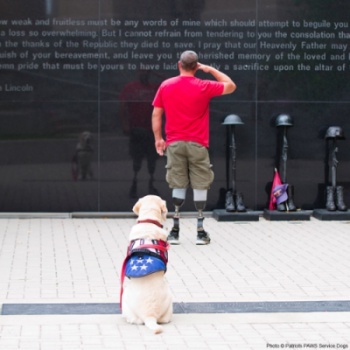 Trained service dogs help Veterans regain their emotional and physical independence – and provide companionship and comfort. This program rescues homeless dogs from shelters and trains them to be service dogs for Veterans… saving lives of both Veterans and dogs! Our brave soldiers have protected us – now we can help protect them. Even the smallest donation can help these American Heroes.